Phil Collins' 2004 live-performance is coming to Blu-ray in March. In an early announcement to retailers, Eagle Rock Entertainment says 'Phil Collins: Live at Montreux 2004' is getting a high-definition release on March 27. There's no word on tech specs or supplements yet, but the release will also include his set from 1996 with his big band in standard-definition. A full track listing can be viewed here. 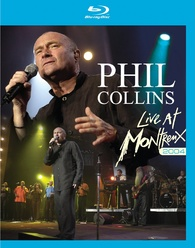 You can find the latest specs for 'Phil Collins: Live at Montreux 2004' linked from our Blu-ray Release Schedule, where it's indexed under March 27.